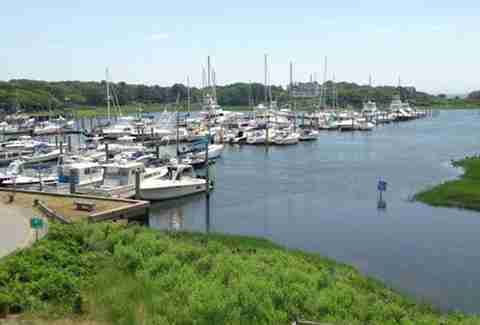 The formula for a perfect New England summer is iron-clad, really: (sea)food + booze + water views = success. Which is why we clog the Sagamore Bridge year after year in Terminator-like pursuit of shorefront repasts. The challenge becomes, however, how to eat and imbibe your way down the Cape without ever losing sight of sea. 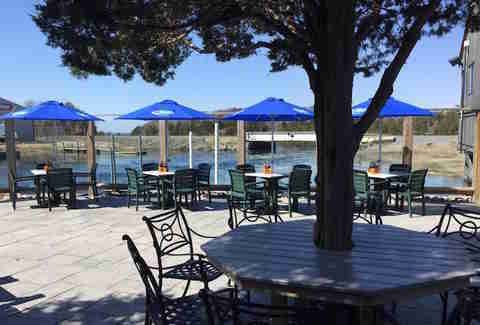 And to help you do that, we’ve compiled the 15 best waterfront restaurants, one per town, to make your coastal crawl as easy as a trip down Quincy Shore Drive. You don’t need to travel like a Swell to dine like one. Sitting on a gorgeous private beach, the well-appointed Beach House is what Travie McCoy’s dreams are made of. Drink deep the cove views while savoring tomato and watermelon gazpacho, pan-roasted scallops, and a truly terrific lobster roll, all complemented by raw bar goodies and house cocktails. Even the restaurant’s Sunday night backyard cookout elevates the genre, with grilled Berkshire pork medallions and line-caught swordfish. 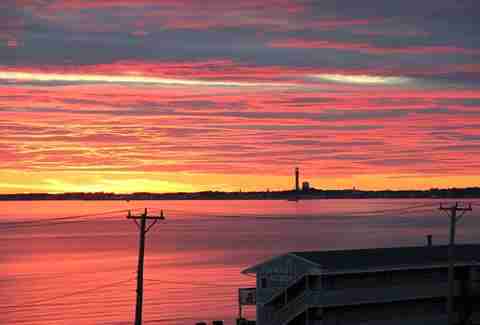 Channel your inner vampire, 'cause this place is allllll about the twilight; the sunsets are FB cover shot-worthy, with the marina and Cape Cod Canal helping to set the scene. It's also the perfect place to indulge in your first baked stuffed lobster of the season, since the kitchen only stuffs that sucker with more lobster meat (no rubbery scallops here). Oh, and did we mention the newly opened outdoor bar, with Adirondacks scattered about? The password is frozen mudslide. It’s tucked inside an inn that’s tucked inside a country club that’s tucked into a golf course. Inconspicuous, to say the least. 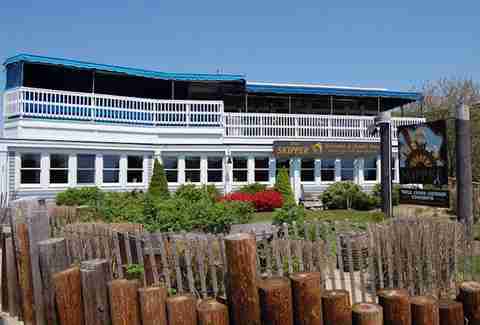 But it’s also 50ft from the ocean, with glass windows that guarantee every diner a sweeping beach view. If you’re jonesing for more saltwater time, check in for the night: guests gain access to the tony beachfront bar and raw bar, otherwise available to members only. So this one’s not technically waterside, as it sits directly across from the Wood’s Hole ferry, but it’s water-adjacent, includes water views, and is also pretty water-fabulous. There’s a deck, a rotating live band in the driveway, and a Mexico-by-way-of-New-England menu that nets you both fried lobster tacos and a lobster burrito. If you seek slightly fancier digs, head next door to sibling Quicks Hole Tavern -- the view from the second floor is worth the climb up the stairs. Plopped literally atop Barnstable Harbor, Mattakeese is one of those places that caters to multiple generations: baked stuffed shrimp for the grandparents, baked stuffed lobster for the ‘rents, and straight-up steamed lobster for yourself (with a starter of oysters and a side of steamers, of course). Frankly though, we suggest ditching the fam entirely and coming for sunset cocktails and apps on a weekend when there’s live music. 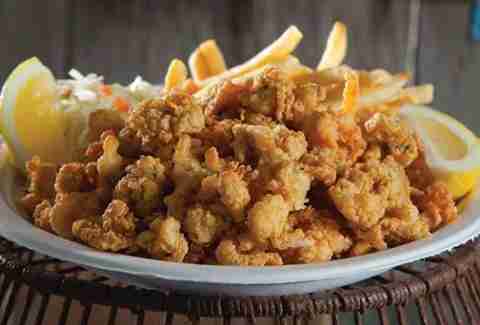 Fried clam chowder. You’re welcome. The award-winning chowder here is so revered that some genius found another way to serve it: frizzled up like a patty. And yes, this hereticism comes with an extensive outdoor patio overlooking Nantucket Sound. They say deep-fried soup is best digested with a dessert chaser, and good thing, because there’s an adjacent ice cream shack peddling soft serve and sundaes. Shingled fish shack adorned with weather-beaten buoys, check. Chalkboard menu, check. Umbrella-covered picnic tables strategically placed next to the shoreline, check. Watch boats cruise the harbor towards Cape Cod Bay as you chow down on a smorgasbord of raw bar pickings like steamers, littlenecks, oysters Rockefeller, and whole chilled lobster. Just remember that it's outdoor only, cash only, and non-alcoholic beverages only. Imagine an ornate stone patio overlooking the bay, with fire pits and cushy seating and every type of well-to-do Cape Codder imaginable. Yep, this is waterside-mansion dining at its finest. Do it proper and go for oysters and beer at sunset: The hotel restaurant has paired up with Brewster oyster purveyor Daley Farm to source local bivalves. 'Tis a detour, 'tis expensive, but 'tis well worth it. You have one overarching dilemma here: nab a water-facing Adirondack before or after lunch? 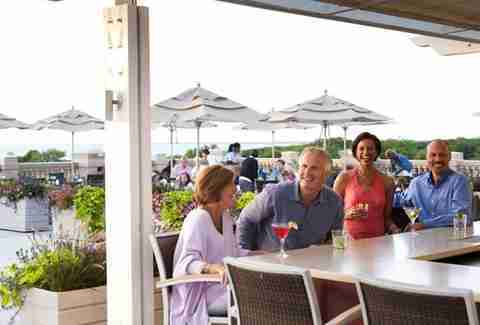 Overlooking the serene and picturesque Saquatucket Harbor, Brax Landing offers both alfresco dining on the outside patio/deck, and alfresco imbibing on those aforementioned Adirondacks. 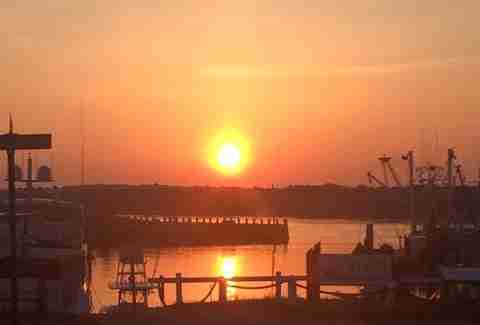 It’s a get-away-from-it-all respite that’s somehow still in the middle of the Harwich Port action, which could explain why it’s also a locals’ favorite. And when you return to your landlocked city hovel and weep nightly for the Cape vacation that was, you can tune into the Brax Webcam and relive the bucolic magic. 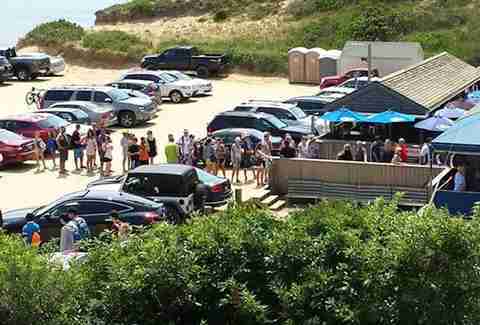 It’s about two things here: the onion rings and the incomparable Nauset Beach setting. The ring batter is almost tempura-like: flaky, light, and addictive; good thing you get a massive pile with your order. Other winners include the fried clams, the lobster roll, and -- okay fine, pretty much all of it. The wait is a killer, no doubt about it, but that’s the price you pay for an iconic meal at an iconic seafood shack on an iconic Cape beach. We’re totally cheating here, since there just aren’t (m)any Eastham restaurants located near the water. So here goes: Arnold’s gives you some of the best fried clams on the Cape and also offer views of its mini-golf waterfalls (cue stupid drum noise). Anyhow. 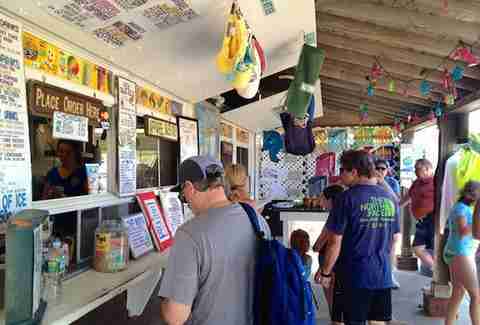 If Food & Wine raves about an unobtrusive seafood shack, you know it’s worth checking out. The warm lobster roll and the onion rings are other musts; lesser known is that the shack houses a raw bar that serves wine, beer, and cocktails with its oysters. 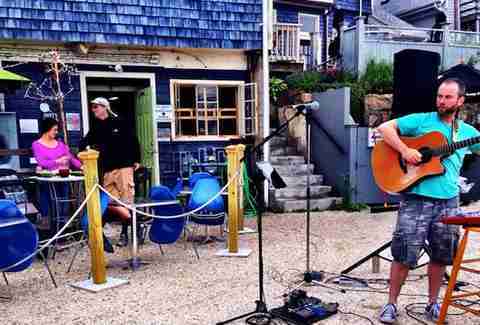 Wellfleet is a dream for those who like a little salt air mixed in with their meal; the downtown area alone boasts a half-dozen restaurants overlooking the harbor. But for our money, shoreline restaurants don’t get more archetypal than the Beachcomber. The bar and restaurant, housed in a former lifesaving station, overlooks the dramatic dunes of the National Seashore; it pours potent drinks with names like the Goombay Smash (that Myers float can be deadly); it hosts live music at night; and it has a separate raw bar often manned by a silent, grizzled patriarch who shucks like a mofo. Our tip: bike or Uber there to: A) avoid the enormous parking hassles, and B) maximize your good time with a minimum of danger. 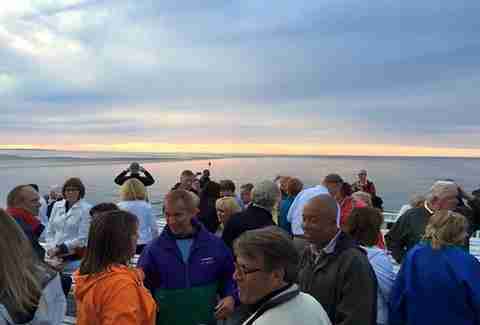 How do you kick off a Cape sojourn? By peeling off the highway the moment you cross the bridge and heading straight to The Lobster Trap, one of those perfectly no-frills New England institutions that reminds us why we brave the brutal winters. 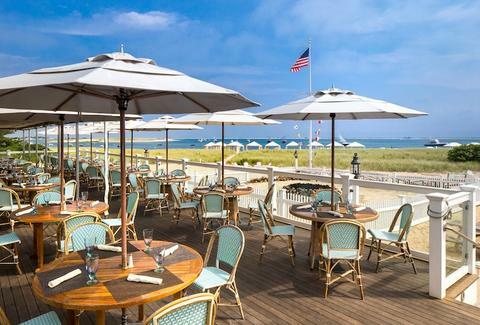 There’s corn hole on the patio to accompany inimitable views of Buzzards Bay, and the menu's got all the staples: chowder, whole belly fried clams, raw bar pickings, and rolls of every ilk (you can even get wild with the Lobster Reuben if you so choose). Okay, so shoreside dining options in Truro are scarce, to say the least. One of the beaches occasionally gets an ice cream truck and maybe a food truck -- that's pretty much it. But in an effort to not leave this space blank, we'll throw out this little cafe inside the Cape-rustic Top Mast Resort; it at least has ample patio space, even if you really can't see the water from it. There are many an oceanfront restaurant in P-town, of course, but the Red Inn is a beacon and an icon and a must. With a back deck that overhangs the harbor and chairs facing the water, the inn is the daily gathering spot for anyone who enjoys stiff cocktails, raw oysters, and the sunset at low tide (that’s pretty much everyone, wethinks). Be prepared for battle, though: you’ve never seen blood drawn over an Adirondack until you’ve gone to the Red Inn for early-evening libations. 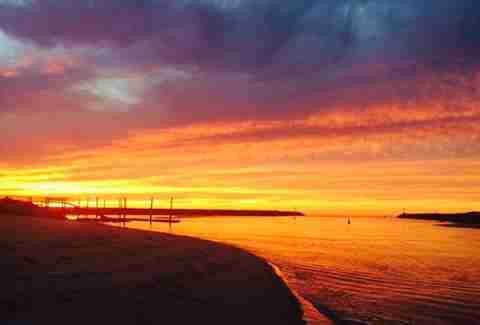 Stay for dinner, because the dining room provides a panorama of the harbor, the bay, the dunes, and the Long Point lighthouse.